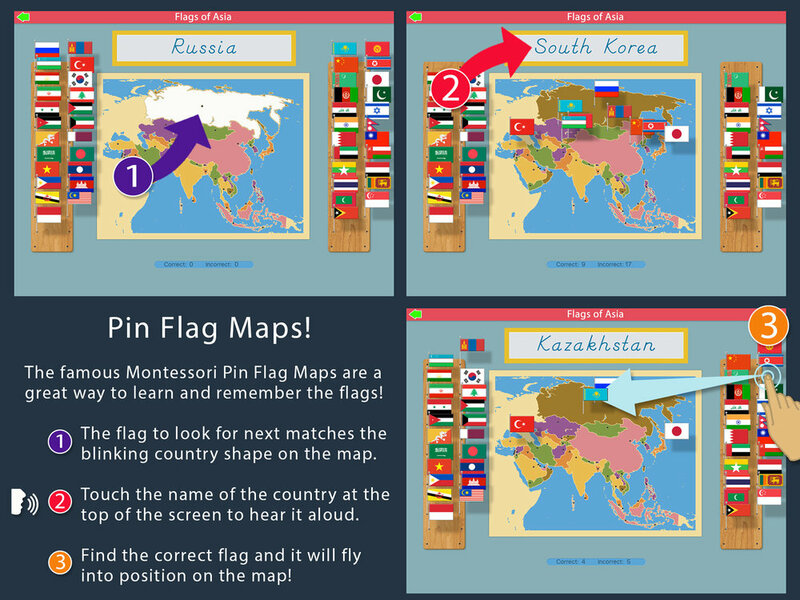 Learn to identify all the country flags of Asia with this app that beautifully complements the materials in the Montessori classroom! In the first lesson, cycle through the flags to see which country they belong to and where it is located on the map. You can also hear the correct pronunciation of the country name. Once you are familiar with them, move on to the Pin Flag Map, where you will be required to identify the flag for each country. When you touch the correct pin flag, it will fly into position on the map, helping you to visualize and remember which country the flag represents! The colors of the countries on the map and the pin flag concept resemble common Montessori classroom materials. Thanks for your support of our Montessori apps.